Who, What, Why: What are the burial customs in Islam? Five days after his death, Muammar Gaddafi has been buried at a secret location in the Libyan desert, say officials. But how does this square with Islamic customs at burial? For several days after he was killed in his hometown of Sirte, the former Libyan leader's body was lying in a refrigerator open to the public. A National Transitional Council (NTC) official told the BBC the bodies were buried at dawn in an unknown location. Unconfirmed reports suggested this took place in the desert with a few relatives and officials in attendance as Islamic prayers were read over the bodies. The circumstances surrounding the dictator's death are extreme, but Muslims are usually buried much sooner. So what does Islamic law say about what should happen? There are regional variations on the interpretation of Islamic law concerning burials but some fundamental principles apply. A person must be buried as soon as possible after death, says Imam Dr Abduljalil Sajid, chairman for the Muslim Council for Religious and Racial Harmony in the UK. This is usually no more than 24 hours later. The reason for speedy burials partially stems from days when hygiene wasn't at its best, Dr Sajid says. It was a way to protect the living from any sanitary issues. In Col Gaddafi's case there was a delay, because it was put on display to convince people that he was dead. Then there was an investigation into how he died and discussions about how best to dispose of the body. But Dr Sajid says it is acceptable to delay a Muslim burial when the person has not died from natural causes. "If somebody has been killed in battle or foul play is suspected then most of these things go out the window," he says, adding that in those cases it is more important to determine cause of death before burial. There are also certain practices that should occur as soon as possible after a person dies, he says, including washing the body and shrouding it in cloth. The US were at pains to stress that Islamic custom was followed in the case of Osama Bin Laden, after Navy Seals killed him in Pakistan in May. US officials said his body was washed and wrapped in cloth, in accordance to Muslim custom, before it was disposed at sea. This apparently happened within 12 hours of his death. The pictures of Col Gaddafi's body after his death suggest he was not washed. According to a translation of his will, Col Gaddafi states that should he be killed, he "would like to buried, according to Muslim rituals, in the clothes I was wearing at the time of my death and my body unwashed." Dr Mawil Izzi Dien, a reader in Islamic studies at the University of Wales Trinity Saint David, says historically, people who die during battle "are not to be washed or…put in a coffin". Based on the wording of the will, Dr Dien says it is possible that Col Gaddafi expected to be killed and therefore "considered himself a martyr - that's why he wanted not to be washed". The public viewing and photographing of Col Gaddafi's body is not usual either, says Dr Sajid. Under Islamic law, it is acceptable to view the body for a short time before burial but "with dignity and with respect", he says, and usually only by the family. 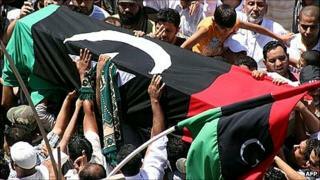 Col Gaddafi's body has been buried in a secret location to avoid it becoming a shrine. This is not uncommon in Muslim countries. In Saudi Arabia, all graves are unmarked, even those belonging to kings. Dr Sajid says that autopsies are never to be performed because the body should not be cut. In Col Gaddafi's case, various doctors have looked at the body and decided that he was killed by a shot, but it is not clear whether his body was cut open in the process.